Common Dreams: I had recently been asked to give a talk about “being an American Muslim in the United States.” Although wary of the uses and abuses of the term, I obliged. Islam is a religion propelled by values, not race nor, theoretically, by blind tribal allegiances, I explained. 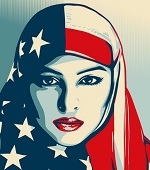 The ‘American Muslim’ identity which has been under constant investigation in US media, politics and society is completely different from what American Muslims associate themselves with. Click here to read more (external link).